Repackaged and 4G enabled, is the One SV the ultimate mid-range smartphone? So it's got 4G, but what else can it do? It's good to see another proper mid-range handset enter the 4G fray, but the Taiwanese firm has got its sums wrong on this occasion and ultimately that's going to make the HTC One SV a difficult one to shift. The HTC One SV isn't exactly a new handset, more or a reboot of the HTC One S which launched back at MWC 2012. That said the One SV arrives sporting a new chassis and slightly differing specifications under the hood, the most of important of which is its 4G capabilities. The price has dropped recently: available SIM-free from around £250 the HTC One SV is a much more attractive proposition, especially if it gets the software update detailed below. Sadly contract deals for the One SV are still slightly more expensive on the UK's only 4G network with EE wanting at least £36 per month for two years in exchange for a free handset. This puts it in competition with the Google Nexus 4, Samsung Galaxy S4 and the Windows Phone 8 powered HTC 8X and 4G-enabled Nokia Lumia 820. While price wise there may not be much between the two, the HTC One SV has a significantly different body which doesn't come close to the premium finish we enjoyed on the One S.
It's out with the aluminium frame and its 'micro-arc oxidisation treatment' and in with a noticeably plastic chassis which actually weighs more than its predecessor at 122g thanks to the size gain round the waist – up from 7.8mm to an almost porky 9.2mm in the midriff. All that aside though and the HTC One SV still sits comfortably in the hand with the soft touch plastic case providing a decent level of grip on our palm while our fingers were easily able to wrap round the handset. The power/lock key located on the top of the One SV alongside the 3.5mm headphone jack and the volume rocker switch are both easily reached during one-handed use thanks to the phone's compact 128 x 66.9mm dimensions. An added benefit of the re-jigged design is that you can easily remove the back cover of the HTC One SV which not only gives you access to the microSIM and microSD slots, but also the removable 1,800mAh battery – which has been given a slight bump to improve the life of the phone. On the front of the One SV you'll notice that HTC has kept its Android touch buttons below the screen with back, home and multi-tasking revealing this handset is running at least Android 4.0. 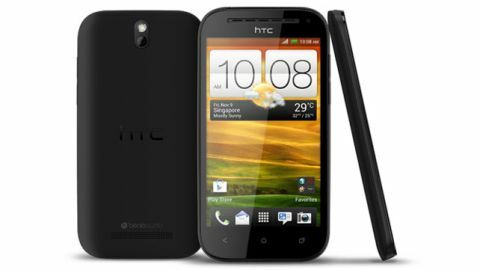 Sadly there's no sign of Jelly Bean on the HTC One SV, with the phone being equipped with Android 4.0.4 Ice Cream Sandwich – disappointing considering Jelly Bean has been available for six months now. However, there might be some good news on the horizon: whilst unofficial, HTC looks likely to be bringing Android 4.2 and the all-new version of Sense to this handset in the near future, which would give it a totally new lease of life and make it a lot more attractive to a number of users. Above the control tools is the 4.3-inch, 480x800 Super LCD 2 display which while being the same size as the offering on the One S actually has a lower resolution than the Super AMOLED screen – boo! Screen quality is still pretty darn good but it doesn't quite have the pop of the display that impressed us so much on the One S, which is disappointing as we'd expect the One SV to be at least on par with its sibling. Something which has been given a boost on the HTC One SV is the front facing camera which comes in at 1.6MP and sits besides an incredible long ear piece – perfect for those who have trouble locating their ear while on the phone. Phew. The extra large ear piece isn't all fun and games though and its recessed nature means it's a great place for dust to collect, making the One SV look rather untidy once it's spent some time in a pocket or bag. Round the back the bulbous circular camera fitting has been replaced with a more refined oval sitting flush to the rear of the One SV. You get a distinctly average 5MP camera, once again another compromise from HTC on the One SV, with a single LED flash for company, although it will record video at 1080p. The HTC logo is slightly indented which led us to run our finger over it many times, just because we liked the feeling. At the base you get a nod towards the One SV's network capabilities with "4G LTE" emblazoned above the speaker grill, with the Beats Audio technology logo below it, showing that Dr Dre's fancy music tech is housed inside. The white back plate does attract marks and we managed to pick up numerous smudges on it after just a day or so. Luckily it wipes clean with a damp cloth, but when you pull out your new HTC One SV to show off to your mates you'll be laughed out the pub when you flip it over to reveal grubby finger prints – oh the shame. On the face of it the HTC One SV may share a similar name to impressive One S, but a number of compromises when it comes to build quality and specifications leaves us feeling a little unfulfilled and with a handset which is closer to the significantly cheaper HTC One V.